We specialize in offering quality Linear Circuit Trainer, which meets the variegated requirements of our clientele. The experienced engineers and qualified designers in-house ensure that the products are fabricated employing the latest trends and technologies. 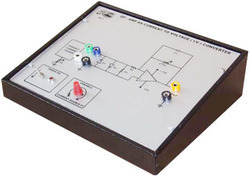 As a noteworthy entity of this domain, we offer our patrons with premium quality of OP AMP Parameter Trainer. Its optimum performance and longer serving life, make this trainer highly demanded in the market. Available with us in various specifications, the offered trainer is maintained as per the industry laid norms at our end. 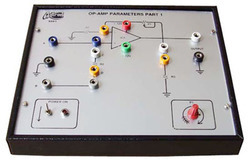 Construction and study of various circuits for measuring different parameters of an op - amp ( op - amp used is the popular 741 ). Study and comparison of various parameters in theory and in practices. Construction and study of op - amp in closed loop configuration. 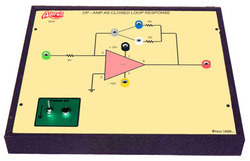 Study of closed loop response by varying the feedback resistors ( gain ). Study the effects of parameters. 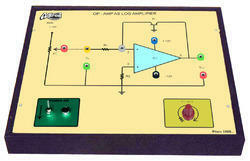 Construction and study of op - amp as a differentiator and integrator. 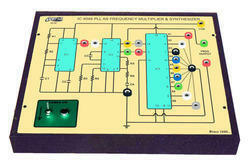 Built - in Bank of components required for constructing differentiator and integrator. Study the effect of the various parameters on the output. 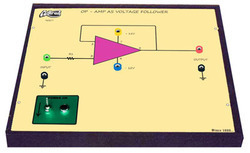 Construction and study of op - amp as a voltage follower. Study the working and verify that the output follows the input and its applications as impedance buffering circuit. 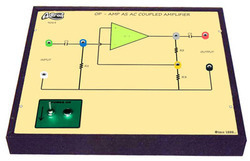 Construction and study of op - amp as an inverting and non - inverting amplifier. 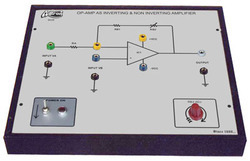 Study, observe and compare the characteristics of inverting amplifier with non - inverting amplifier. Construction and study of op - amp as a log amplifier. Study the working and verify that the output of the amplifier is proportional to the logarithm of the input. Study the effect of the various parameters. 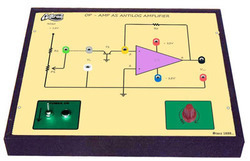 Construction and study of op - amp as a anti - log amplifier. Study the working and verify that the output of the amplifier is proportional to the anti - logarithm ( or exponential ) of the input. 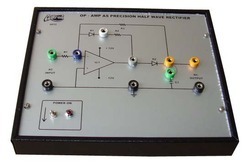 Construction and study of op - amp as precision half - wave amplifier. Study the compare the advantages and uses of a precision half - wave rectifier using op - amp over a regular half - wave rectifier. Construction and study of op - amp as precision full - wave amplifier. Study the compare the advantages and uses of a precision half - wave rectifier using op - amp over a regular full - wave rectifier. Construction and study of op - amp as an AC coupled amplifier. 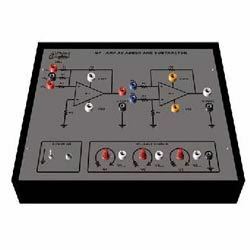 Study the compare the advantages and uses of an AC coupled amplifier with a regular amplifier. 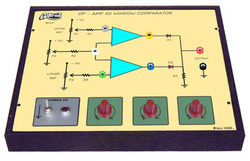 Construction and study of op - amp as windows comparator ( windows detector ). Study the working and determine whether the input amplitude flies within the “window”. Construction and study of op - amp as voltage to current converter ( trans - conductance amplifier ). Study the working and verify that the output is proportional to the input voltage signal. Study the effect of parameters. Construction and study of op - amp as constant current source. Study the working and verify that the output current is independent to the voltage ( for a limited range ). 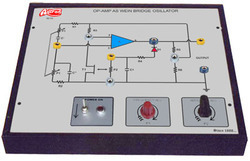 Construction and study of op - amp as wein - bridge oscillator. Study the working and observe that a balanced bridge is used as the feedback network. 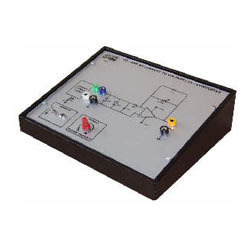 Owing to our rich experience and knowledge of this domain, we have been able to manufacture the best quality of OP AMP as Comparator Trainer. 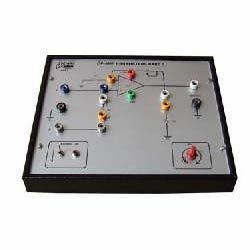 Used for studying the construction and working of op-amp as a comparator, the offered trainer is highly user-friendly. In addition to this, the offered trainer is available with us at cost effective and industry leading prices. Construction and study of op-amp as a comparator. Study the working and verify that the output is a function of the result of the two inputs. From the first day of our inception, we are instrumental in providing our patrons with best grade OP Amp as Adder & Subtractor Trainer. 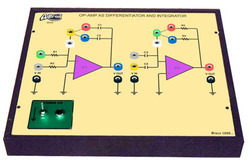 To study op-amp as adder and subtractor, the offered OP AMP as adder & subtractor trainer is used. The optimum quality of the offered trainer is maintained as per the industry set norms. Construction and study of op-amp as adder and subtractor. Built-in bank of components required for constructing adder and subtractor. By providing the optimum quality of OP Amp As Current to Voltage Converter Trainer, we believe in making a long lasting with our patrons. 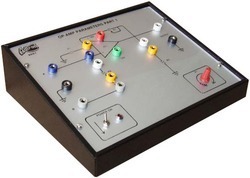 Available with us at cost effective prices, the offered trainer is used for studying the op-amp as current to voltage converter (trans-resistance amplifier). The offered trainer is available with us in bulk quantities, as per the needs of our patrons. 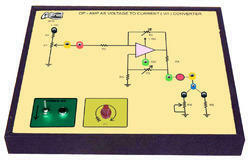 Construction and study of op-amp as current to voltage converter (trans-resistance amplifier). Study the working and verify that the output voltage is proportional to the input current signal. 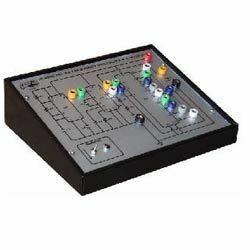 Adtron’s phase lock loop (pll) as frequency multiplier and synthesizer is a versatile self-contained stand alone unit, useful in the study and demonstration of the application of pll as frequency multiplier. The circuit consists of ic cd4046 and ic 7490 and required components. A square wave input of 1khz is also provided which is to be applied at the input and output to be observed on cro. The trainer is enclosed in a special designed elegant powder coated metal cabinet with intelligently designed layout on imported acrylic front panel, are some of its other features. Input signal: 1khz generated internally using ic 555. 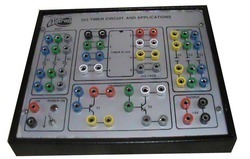 Test point: multi-coloured test points at various stages in the circuit to observe waveforms and voltage. Power Requirement: 230v, 50hz ac 1 φ. Looking for Linear Circuit Trainers ?